In Win has launched another unusual yet desirable PC chassis. 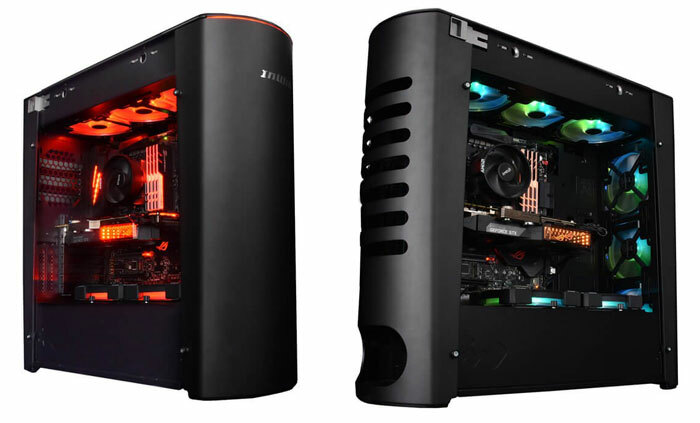 The new In Win 915 is an E-ATX full tower chassis with a pleasing rounded minimal anodised aluminium front, tempered glass side window and a motorised top vent. 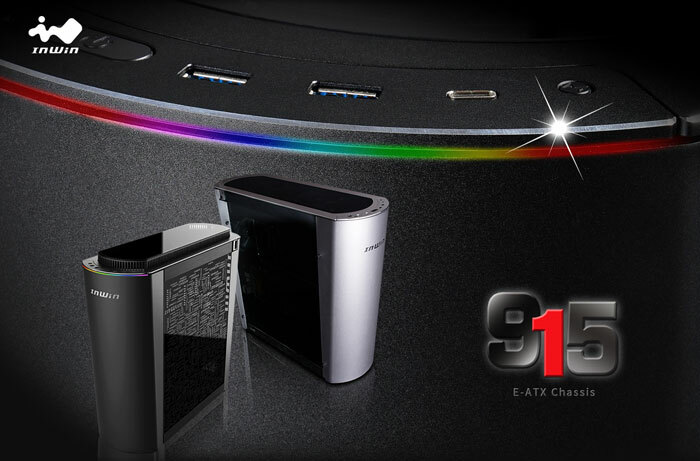 It offers plenty of expansion options, cooling options, and eye catching yet tasteful RGB LED illumination. Let us first consider the exterior of the In Win 915. The maker has constructed this full tower chassis using anodised aluminium panels (in black or white) and smoked tempered glass. The front is curved and minimal, especially as In Win has chosen to put the 'front I/O at the front top of the chassis. Around the back is another curved aluminium panel with a slotted design to give access to the expansion cards and other ports. Another external key signature of this design is the auto venting top panel. In the top panel area you can fit up to 3x 120mm fans or up to a 360mm radiator. In the video you can see In Win has installed RGB fans in this area. The panel can rise/open when extra cooling is required and will close up 15 seconds after shutdown. Top panel access provides 1 x USB 3.1 Gen 2 Type-C, 2 x USB 3.0, HD Audio, Top Cover Ventilation and an LED Lighting Control Switch. The last external aspect to ponder over is the RGB LED lighting provided. In Win describes this feature as "low-key but eye-catching". In the chassis are 13 built-in lighting modes. Users can control the lighting via the button atop of the chassis or plug into the motherboard's programmable (5V / 3-pin connector). As well as fancy effects the lighting can be used for system monitoring/warnings. Delving inside there are plenty of expansion options, as one might expect of a 570 x 230 x 645mm chassis. You can fit 12 x 13.5-inch E-ATX, ATX, Micro-ATX, Mini-ITX motherboards, 8 expansion cards, 13x 2.5-inch drives (or 4x 3.5-inch drives and 9x 2.5-inch drives), up to 9x fans or four radiators. Maximum compatibility figures are as follows; for VGA Card Length 410mm, VGA Card Width 168mm, Vertical Display VGA Card Height 50mm, CPU Heatsink Height 164mm, PSU 250mm Mounting Area (length up to 320mm when two HDD cages removed). Overall this chassis weighs a considerable 16.4kg. To wrap up, we don't have pricing from In Win today, though this chassis, first seen at CES 2018 at the start of the year, is now launched and expected to hit retail on 15th August. If you live in the US it looks like Infinity Custom PCs will be making use of / selling this chassis. Seen it in cases before. It was naff back then and it's naff now. Sorry InWin. It should be venting as best as it can be all the time, rather than some of the time. If it opening is a solution to the cooling, then that shows it being closed is actually hurting it, and if that isn't in any way going to resolve the cooling then not only is that un-necessary but you then have big problems. Either way, the vent isn't doing what it is supposed to be doing. 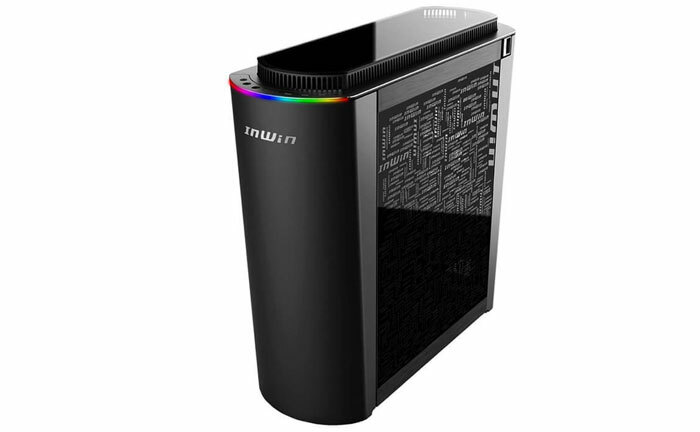 I dont know, to me I prefer a silent system which is why I watercool but it would make it even quieter if I could close off the top vents while im just idling or doing small tasks i.e not gaming or high computational stuff. This may seem like a gimmick but if its done right it could be really nice, would like this to be a normal feature! Touch too heavy for my liking.. I like it, perhaps weirdly my biggest concern is how tall and thin it seems to be, and with a weight like that… one knock and you're in trouble, surely? Spooks me. Edit: where does the airflow originate? Solely from the bottom, on the other side of the PSU shroud? Can't imagine it being very effective.